Artificial intelligence is transforming how government agencies carry out missions and serve citizens. Watch the interview on Government Matters, "Artificial intelligence to change the way people in government work." The advent of artificial intelligence has moved rapidly in government. In May 2017, Congress established the bipartisan Congressional Artificial Intelligence Caucus, and members have since introduced numerous pieces of AI legislation. More recently, the administration launched the American AI Initiative through a February 2019 executive order, and the U.S. Department of Defense also recently released its own strategy on how to incorporate AI into national security. As agency use of AI evolves, leaders will look for pathways to capitalize on opportunities, and the workforce will need new technical and social skills to succeed in AI-augmented workplaces. 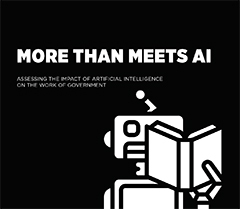 In this context, the IBM Center for The Business of Government and the Partnership for Public Service are releasing a new report today, More Than Meets AI: Assessing the Impact of Artificial Intelligence on the Work of Government. This report addresses how government can best harness AI’s potential to transform public sector operations, services, and skill sets. The report draws on insights from a series of roundtables with government leaders to explore pressing issues surrounding AI, share best practices for addressing solvable challenges, and work toward an implementation roadmap for government to maximize the benefits of AI. More specifically, AI could enable agencies to fulfill their numerous roles efficiently and effectively by reducing or eliminating repetitive tasks, revealing new insights from data, driving better decision-making, improving customer service and enhancing agencies’ ability to achieve their missions. AI could help federal employees focus on core responsibilities related to their agencies’ missions and spend fewer hours on administrative duties. They are likely to have more time to deliver services, interact with customers and perform other mission-related tasks. That said, agencies will need to enhance their digital and data literacy and learn how best to use AI and related technologies to work with citizens effectively. The report focuses on three areas of impact that the experts agreed agencies will need to consider and manage, and makes recommendations for action in each area: a transformed workday, the potential for personalized customer service, and the increased importance of technical and data skills. The report supplements a prior work that the Center led around this topic, including the roundtable summaries cited above as well as a longer report, "Delivering Artificial Intelligence in Government" by Kevin Desouza. That report focused on building foundational capacities needed to enable successful AI implementation, including a secure and modern technology infrastructure, strong data management, a skilled workforce, and an ethical and transparent policy framework. Automating administrative tasks will be one of AI’s initial benefits. Over time, federal employees will spend less time on repetitive administrative work and more of their workday on tasks that are core to their agencies’ missions, from mitigating hazards in workplaces to following through on complicated applications for grants or other government services. Agency political leaders and senior executives will have to manage change if AI transforms the federal workday as foreseen. The Office of Management and Budget (OMB) should focus on AI in the context of cross-agency priority (CAP) goals, showing the federal workforce the “art of the possible.” Through CAP goals, OMB and agencies should focus on government-wide areas of concern where AI could improve mission delivery, and monitor progress made toward the CAP goal to demonstrate AI’s value to agencies’ missions. If AI decreases time spent on clerical work and increases the amount of information that can be collected and analyzed, employees could focus more of their time and attention on customer service and tailor services to the needs of individuals. As AI enables employees to focus more on the customer, federal agencies should help their employees improve their customer service skills. Agency recruiters and hiring managers should assess job applicants for the skills listed above. Some digital tools already enable hiring managers to assess job candidates for these capabilities; for example, USA Hire measures social literacy through decision-making, interpersonal skills and reading comprehension. Federal employees in the future will need new skills to succeed in an AI-enabled world, including technical, digital and data literacy. As AI becomes more ubiquitous in federal workplaces, the federal government should emphasize expertise in technical, digital and data skills. OMB should work with the General Services Administration to establish a team for AI talent similar to the U.S. Digital Service, governed by rules that make it easy to hire top AI talent from the private sector for time-limited stints in government to help federal agencies that need AI expertise. Going forward, government agencies will play a crucial role for other sectors adopting AI, for example by ensuring that malicious actors do not exploit AI-powered algorithms. This essential role underscores the need for government to become a responsible user of the technology, embed ethics and transparency in AI implementation, and translate its experience with AI into guidance for other sectors. Every part of government plays a role in ensuring that the transition to an AI-augmented federal workplace is as smooth as possible and that federal employees have the skills to thrive. The Partnership and the IBM Center hope that our continuing research and recommendations will spark a conversation on the use of AI, help prepare federal leaders to assess the inevitable changes coming, and provide government with insights to navigate through this transformative time.